Kirina Shilo a type 3 independent self contained companion WIP, and will continue being built by Razorsack and myself when possible. Razorsack has my permission to continue building Kirina. I will assist when I can to help Razorsack. 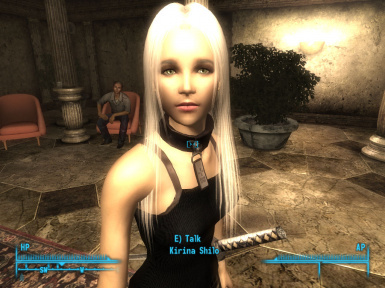 Kirina Shilo is ported from New Vegas to FO3 and is a WIP. Kirina is self contained, this is she has everything she needs to look and function without the need to install additional mods. With permission from keldable to use his Jasmine companion as a base to port my Kirina to FO3. I have now rebuilt but kept the same structure and design as I had using Jasmine. Kirina starts off in Megaton plaza and when you enter Megaton she will approach you or an alternate start location Tenpenny Tower (if you like to blow up Megaton or just want her to start somewhere else). Kirina wishes to travel with you, so take her along, protect her and give her the experience she needs. Kirina is a inexperienced explorer adventurer. She lives in DC with her Uncle and brother. As her story will go, she will look for the lone wanderer and travel with him/her until Kirina gets word of her parents (who live in Nevada (Mojave)) are killed and she will leave to go bury them and hunt their killers (Something I want to add for FNV Kirina). This is the quest/game play I want to implement into Kirina's story but am unable to right now.. Currently Kirina will follow you till the ends of the earth but will only follow until she hears of her parents death (When I get this added) Kirina will sneak with you, draw her weapon when you do, she will go home (after you set one) you can fire her, have her wait still and rest or guard. Kirina will look for and find you when you enter Megaton or Tenpenny Tower (which ever you choose as start for Kirina). Kirina has many features of most companions. You can set a home for her, send her home, fire her, change her weapons and combat style. Can set her bravery, essential/non essential. She will sneak and draw weapon when you do, she will wait, guard and rest here. Have a look. Kirina wears Exeter's type3 leather armor and uses necKros Katana swords as default weapon. Kirina will give you a pair of summoning glasses when she is hired. She is set to avoid Vault87 as I hear it causes all sorts of issues when companions enter it. For v1.0 users: remove the old GIP_Kirina.esm or esp and replace it with the Kirina_Shilo_2.esp or esm, the esp file has better color matching for face and body..
For updating versions above 1.0 just replace the Kirina_Shilo_2.esp with any update. Extract the archive and copy the meshes, textures and Kirina_Shilo_2.esp I am not sure if you can use fomm to install this mod but if you can please let me know so I can update this install info. Enable the new esp in fomm and run. I have only included just the esp and she is set initially to essential and can be changed in dialog. V2.0 is the new build and slightly improved , Kirina will look for you when you enter Megaton and initiate the conversation. V2.1 *Fixed Kirina not changing from Ranged to Melee and vice versus. V2.2 fixes Kirina traveling all over the waste to find you, now she will just look for you in Megaton and come to you. Sorry for the freakish behavior . V2.2 Alternate start. Kirina is located in Tenpenny Tower lobby and she will come to you when you enter. Nothing else changed yet just her start location. A Really big thanks to keldable for permission to use his Jasmine companion as a base to port my Kirina from New Vegas and for all the help and support I needed to get everything working correctly.- Thank you. Lucharie-textures - Backsteppo narrowed shoulder textures- Thank you. Big Thanks to Exeter for the type 3 leather retextures and permission to use freely. 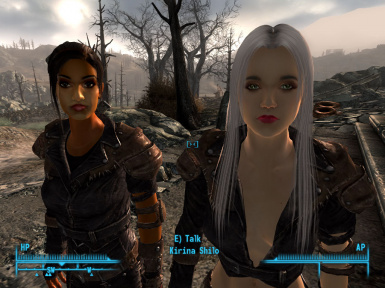 Big Thanks to Ren for Oblivion hair (modders resource as I am told) and to Ashara for the Fallout3 port. A Big thanks to noddist for all the testing he's done for me, the countless hours of game play to find all the errors and issues for me to fix. :-) Thanks man I appreciate it. I hope I credited everyone correctly and everyone I should. If I left you out I am very sorry and will add you. The outfits shown in my images are from Anthony in Tenpenny Towers with Lings Finer Things installed. This file is provided as is and the author holds no responsibility for anything that may come to happen from using this file.